Srihari kurade proudly walks through his orchard of kokum (Garciniaindica), a wild fruit that is famous for its therapeutic properties. With more than 2,400 trees spread over seven hectares (ha) of land, his orchard in South Goa is the world’s largest kokum plantation. Kurade is also perhaps the only farmer in the region to have taken up systematic large-scale plantation of the fruit that is endemic to the Western Ghats. Almost every part of the sweet and tangy fruit has some medicinal or industrial use (see ‘A healthy option’). Still close to 85 per cent of the fruit used to go waste every year till 2010, according to a survey conducted by Goa non-profit the Western Ghats Kokum Foundation (WGKF). The survey says that the fruit is cultivated in small plantations in North Karnataka, Goa, southern Maharashtra and parts of Kerala and the collective acreage under itis not more than 1,000 ha in the Konkan region. However, WGKF, and other local groups, are now trying to rewrite the story of the healthy fruit. The primary reason farmers shy away from growing kokum is that it clashes with mango harvest. “Mango has a lucrative market unlike kokum. Besides, this tree is mainly found in deep forests making transportation difficult. Thus most of the fruits go waste,” says Miguel Braganza, joint secretary of WGKF. Though kokum has been popular as a traditional medicine, it was widely used only in kitchens as a culinary item till about 2000, says Ajit Shirodkar, chairperson of WGKF. The harvest season and the shelf-life of the fruit are very short. “The harvest season of kokum is between the second week of May and the end of the month. Once the rains start in the first week of June, even the plucked fruits start to decay. As a result, farmers are forced to sell them,” says Shirodkar. 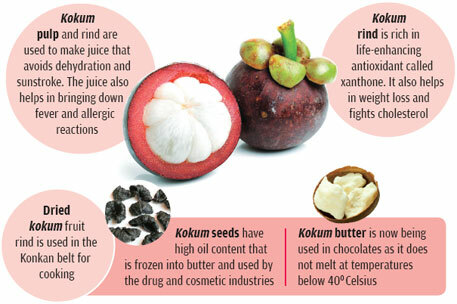 The kokum story saw a positive twist in 2000 when WGKF was set up with the sole motive of making the fruit popular. In the next few years, the group surveyed and catalouged the available varieties of kokum. The foundation then worked on creating awareness among farmers and academics for the promotion of the fruit. “When we asked farmers to take up kokum plantation on a large scale, they said there are no buyers. That is when we came up with the idea of manufacturing value-added products of kokum. So in the past four to five years, value-added products such as kokum juice, kokum syrup and kokum date have become popular in the region,” says Shirodkar. And the impact is visible. Several small-scale firms have started to earn good profits from kokum products while ensuring better prices to the farmers. One such firm is Sindhusfurti Natural Food and Research Pvt. Ltd. that is promoted by Konkan Nisarg Manch, a Sindhudurg-based non-profit that works in the Konkan belt to generate livelihood opportunities by promoting neglected natural resources. The company shares 11 per cent of its profits with kokum farmers. “Our main focus is to provide farmers due value of their produce,” says Santosh Pednekar, head of sales and marketing at Sindhusfurti. Last year, the company bagged a US contract to export three tonnes of dry kokum. The contract was fulfilled with the help of 50 small farmers and nine self-help groups. “We agreed to export our products only on the condition that they will pay Rs 100 per kg to the farmers as against the prevailing price of Rs 35-40 per kg. In return, we promised to hygienically collect the fruits,” says Pednekar. This pushed the local price of kokum to Rs 120 per kg. “Till two years back, I sold them for Rs 35-40 per kg. Last year the rate increased to Rs 60 per kg. This year, I am expecting to sell the fruit for over Rs 100 per kg,” says Kurade. Sindhusfurti is now trying to popularise kokum rind in Indian markets by targeting yoga centres, health centres, and medical shops. It has bagged a contract with the Central and Western Railways to sell kokum soda at stores, platforms and trains. Retail chain Big Bazar is also selling Sindhusfurti products at its Maharashtra outlets. The recent attempts have helped in convincing farmers to cultivate kokum, but a lot remains to be done. For starters, standardisation and certification of kokum products is required “to expand the product’s market at national and international level”. “Right now, everybody is processing products as per convenience. This is not good for the market,” says Shirodkar. Scientists at the Balasaheb Sawant Konkan Krishi Vidyapeeth (BSKKV), Ratnagiri have prepared standard procedures for popular kokum products and are developing procedures for certification. The agriculture university is also developing kokum varieties that can be harvested much before the monsoon, says B N Sawant, agriculture scientist at the BSKKV’s regional fruit research station in Sindhudurg. Shirodkar also warns against false claims made by sellers about the fruit. “Several fly-by-night operators are selling Garcinia and other varieties found in Sri Lanka and Thailand as a wonder fruit that can reduce fat in weeks. Such exaggerations are not scientifically proven and can hamper the reputation of the fruit,” he adds. Braganza says the long-term challenge is to create a market that benefits both farmers and customers. I have read the article on website http://www.navhindtimes.in/agriculturists-asked-to-focus-on-market-needs/ and I am in search of Mr. Ajit Shirodkar. Can you please help me out with his contact details?